Night moves: Try these bright ideas if you're running outside after dark. As fall approaches, it’s getting darker earlier. Temperatures are comfortably cooler when the sun goes down, so nighttime is a perfect time to go for a run. 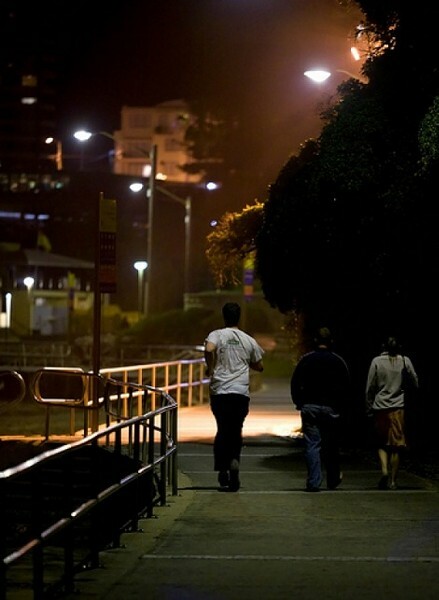 But night running requires special preparation and attention—if you want to get back home without damage. For example, you may think wearing white is all you need to be visible to traffic. Not so, says a company that makes the reflective material that adorns some jackets and shoes. 3M, maker of Scotchlite Reflective gear, has started a campaign called “No White At Night.” They’re not suggesting that runners stop wearing white, just stressing how much more visible they will be wearing reflective strips instead of depending on a plain white T-shirt for night safety. Runners adorned with reflective material are visible to cars 1,000 feet away, according to 3M. In darkness, a white shirt usually doesn’t become visible until about 250 feet away. The National Highway Traffic Safety Administration says it may take a driver more than 500 feet to notice a pedestrian, react, then maneuver his or her vehicle safely away—and that’s not counting the extra space needed by drivers who pay more attention to their cell phone than to the road. 1. Get a headlamp. You can buy one for about $20, and it can be adjusted to illuminate the road ahead. Those who’ve fallen over a kid’s scooter, left out on the sidewalk, that’s become invisible at night will curse their lack of a headlamp as they rub their bruised and bloody shins. 2. Never run in an area you haven’t already run through at least several times during the day. I’m not the only one to have painfully smashed a kneecap after tripping on a piece of sidewalk sticking up above the surrounding pavement. This is hard to see at night, even in a brightly lit intersection, and even with a headlamp. If you trip over a piece of raised pavement and need medical care, take pictures and contact the city or county that owns the sidewalk. If it hasn’t been kept in good condition, you should ask them to pay for X-rays and other necessary treatment. Remember also that automatic sprinklers, both residential and commercial, are often set to come on at night. If your ears have buds in them, you won’t hear that hiss that warns of the coming spray. There’s no way to evade the deluge once you’re caught in it (don’t run out into the street), but it’s a good thing to mark both the time and place so you don’t get wet again. If you’re running in your own ’hood, chances of getting attacked by human predators is low, but caution is always a good thing. If you see a group of people in a yard or spot someone walking toward you who you don’t immediately recognize, the safest thing is to run to the other side of the street (checking first for traffic, of course). Finally, dogs: If an unleashed dog in a yard starts barking and following you, it may just be doing the territorial thing; once you get a few houses away, the pooch may go back home. If a dog comes after you with obviously aggressive intent, don’t be too embarrassed to run to the closest door and knock (or scream) for help. Here’s a tip to ward off dogs (it’s always worked, though I’m not promising anything): If a dog is coming toward you and growling, keep running, but look over your shoulder directly at the dog and growl back. Do it with a real roar, not timidly. Treat loose dogs just like strangers: When you see one, cross the street and continue your night run.